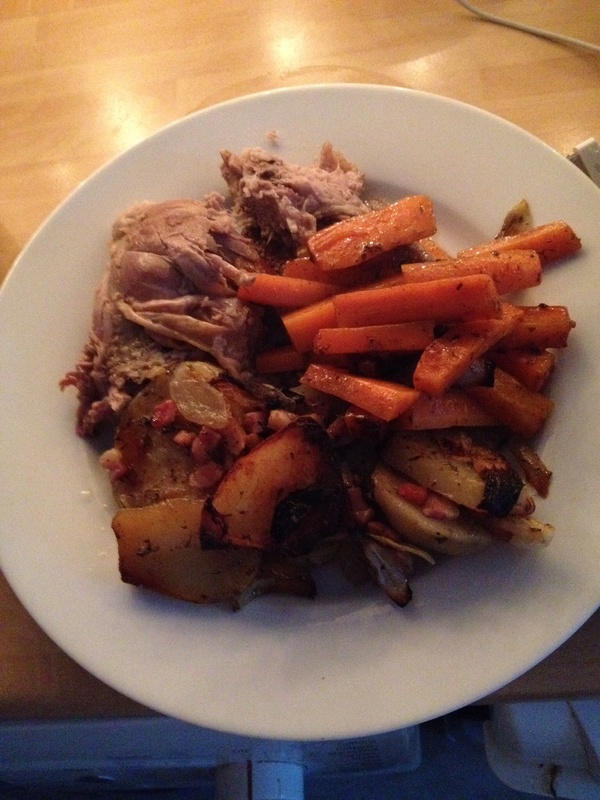 I’ve not often cooked duck but following on from a Twitter chat last week about game we happened to see a half price Gressingham Duck at weekend and jumped at the chance to try it. I started to search the internet and (as often happens) a Nigel Slater recipe caught my eye. It wasn’t a recent one having appeared in the Guardian in 2001 around Christmas time. I like the fact we’re of the same mind when he wrote “I am not a member of the rare-duck club, much preferring mine properly cooked, juicily brown all through”. His recipe calls for Marsala which I didn’t have so I replaced this with Grand Marnier. 2. Remove the giblets from the duck. 3. Cut the pancetta into cubes if not already done and put it into a large roasting tin with a tablespoon of oil, then warm it over a low heat, letting the pancetta flavour the oil. 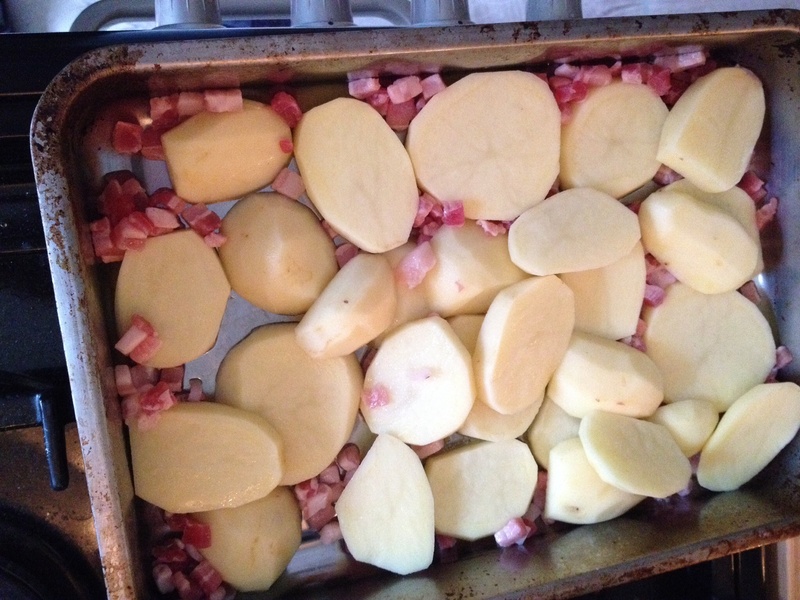 Add the slices of potato into the fat and let them cook slowly. 4. While this is happening, peel and cut the onions first in half then each half into about six, then add them to the potatoes along with the thyme leaves stripped from their stems. 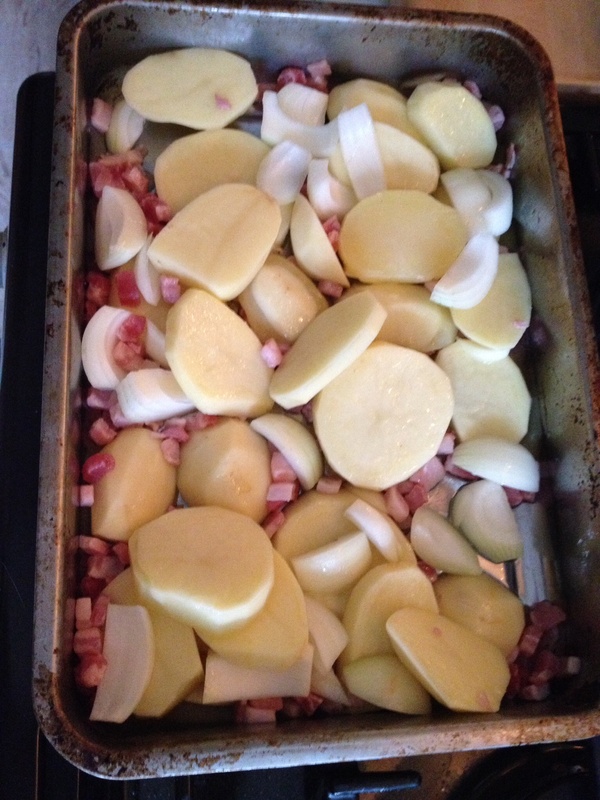 Turn everything over gently as it cooks, letting the potatoes and onions colour very slightly. Season with salt and black pepper then remove from the heat. 5. Prick the skin of the duck all over with a fork, then season it inside and out with salt. Place the duck on top of the potatoes then put it in the oven and roast for an hour and a half until the potatoes are soft and both they and the duck are golden. If some are browning too quickly move to one side, and spoon any cooking juices over any that appear dry. 6. During the cooking, remove some of the fat that is pouring out of the duck and that has not been absorbed by the potatoes. 7. Test to see that the duck is done. There should be no sign of blood in the juices and the skin should be crisp. Remove the potatoes to a warm serving dish. 8. Turn the oven up to 220 C/gas mark 7. Put the duck back in the oven again and let it crisp up for 10-15 minutes. Then remove the duck to a warm dish. 9. Quickly pour the Grand Marnier into the roasting tin and place it over a moderately high heat (you don’t want it to all boil away), scraping at any stuck bits in the pan. The idea is to get any pan stickings and sediment to dissolve into the gravy. 10. 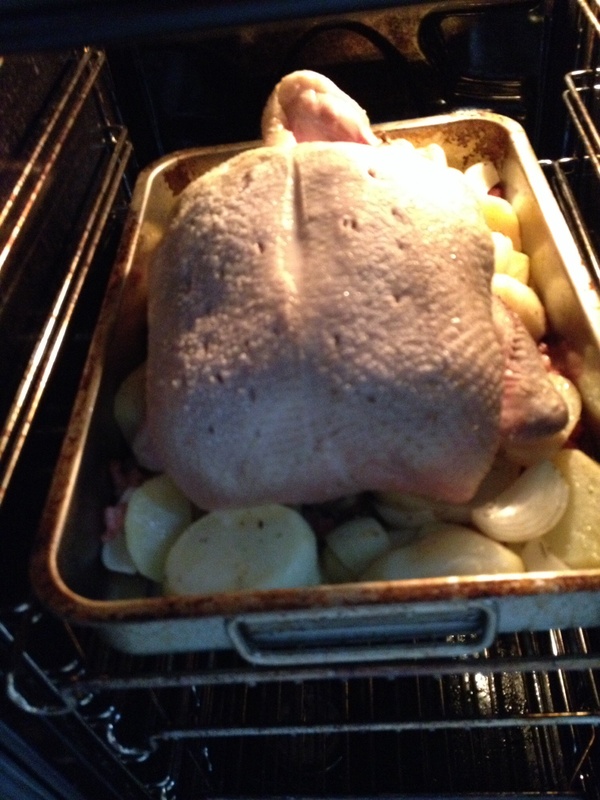 While the sauce is bubbling, carve the duck and serve it with the potatoes. Check the pan juices for seasoning – they may need a little salt – then spoon over the duck.